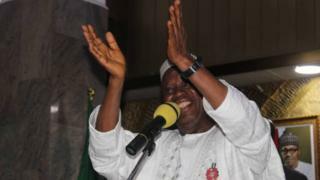 Di Independent Electoral Commission don declare di rulling All Progressives Congress candidate Abdullahi Ganduje as di winner of di govnorship election for Kano state. to defeat im closest rival, opposition People's Democratic Party candidate Abba Kabir Yusuf wey get 1,024,713 votes. Before di announcement, some of di party agents bin don express dia concerns about di election process say wuru-wuru full am. "Basket full of lies, wuru-wuru and mago-mago" na im one of di pipo wey tok for di collation centre call di election. But APC chairmo for di state Abdullahi Abbas wey tok immediately after di declaration yan say dis victory show say Kano pipo dey enjoy wetin Ganduje dey do as Govnor. Some youth don already gada outside INEC office for Kano to protest wetin dem call stealing of dia mandate. One of di leaders of di organisers of di protest Aliyu Isa bin post for Facebook earlier on say dem dey gada to show say dem no gbadu wetin INEC do and dem dey concerned about dia stateOn Saturday, PDP chairmo Engr Rabiu Bichi hold press conference wia e tok say election no hold for Kano and na just thuggery happun.